This massive injector is in a class of its own when low end throttle response and short pulse width control is required. State of the art Data Match Technology dynamic flow matching is used during the production of these injector sets due their large flow rate. This significantly improves the ECUs ability to control these injectors in the sub 2ms pulse width area, typical of idle and part throttle conditions. 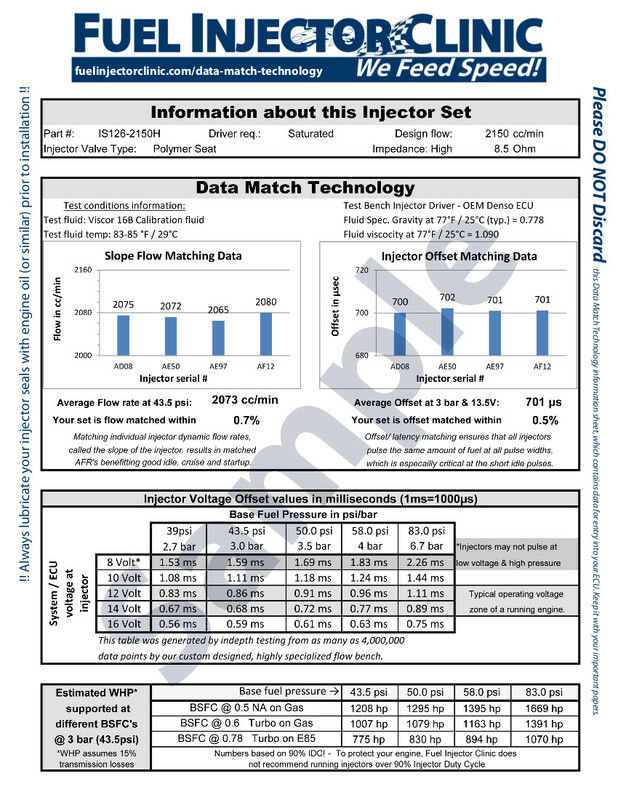 Each injector is individually serial numbered and the results are provided on the Data Match Sheetproviding the most complete flow matching and latency value information available in the industry today. Fuel Injector Clinic injectors are flow tested and rated at 43.5psi (3Bar) at 90ºF fuel temperature using CF-16B calibration fluid.